When it comes to typography or font style in web design, it really does matter which font you choose. If every template or theme used the same font style, it would be very bland. Fonts accent the website design, the content, and make it enjoyable to read. 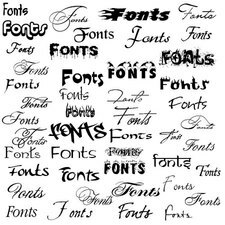 Every person might have their favorite font style, but fonts can bring out emotions and feelings and excite or depress the reader. There are hundreds of fonts to choose from that are both free and paid. * This font may not appear on certain browsers. The fonts extend beyond this to a lot of paid and free ones which can be installed through an FTP server and calling those specific fonts via CSS. Fortunately, Google has made it even easier than that, and now a line of code can give any web designer access to the hundreds of fonts available on the Google Font website. Click to view the Google Font List which will show you all the fonts in a live preview mode on the page. There are so many fonts to choose from. Different fonts are for different styles and bring your website and content to life. There are many reasons to choose a certain type of font. Depending on the website theme you have chosen, a specific font may be most fitting for it. Fonts are like the lighting, furniture, and fillers of the website environment. This webpage shows you what the best fonts are for Flat Design. This is a list of some font styles as they appear in MyPost and may provide you with some ideas for which fonts to use for your next post. All of these fonts are beautiful in their own way and do not take much effort to incorporate into any website or post. For use on MyPost, simply click on SHOW ADVANCED OPTIONS, and select the Font under Headline Font and Content Font to match your preferences for your post. Make a post today and find your favorite font!